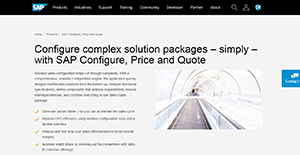 SAP CPQ (Configure, Price, and Quote) is a reliable sales configuration system. The application is designed to help users to cut through the complexity of selling solutions that feature multifaceted combinations. It streamlines and automates the solution selling process to enable users to deliver solutions that meet unique customers’ requirements. This CPQ program facilitates advanced integration capability and efficient configuration performance. SAP CPQ has a comprehensive, scalable engine capable of performing bottom-up configuration and the normal top-down approach. The software also provide robust configuration tools that enable users to define component requirements, analyze functional specification, blend multiple solution components, and resolve interdependencies. Its complete technology solution integrates seamlessly with service and sales applications to deliver a tailor-made package for increased efficiency. SAP CPQ is engineered to help user automate and accelerate the sales cycle. It provides robust configuration tools and an intuitive interface that simplify the configuration and selling of solution that feature complex product combinations. Its innovation makes it easier for users to preserve configuration model data to monitor performance and boosts business scalability. The success of this program is precipitated by its all-inclusive, and scalable configuration engine. The engine eliminates the complexity and enables the application to design multidimensional solutions from the bottom up. One of SAP CPQ key component is the solution configuration environment. This is a robust module used to outline configuration of solutions in sales order and quotations. It integrates seamlessly with order processing transaction in the SAP ERP, SAP CRM, and Hybris Commerce systems to provide a flexible configuration environment with two modeling options: advanced mode and compatible mode. The compatible mode facilitates modeling of simple product configuration whereas the advanced mode is designed for complex solution configurations. If you are considering SAP CPQ it may also be sensible to check out other subcategories of Best CPQ Software gathered in our base of B2B software reviews. Organizations have unique needs and requirements and no software solution can be just right in such a situation. It is futile to try to find a perfect off-the-shelf software system that meets all your business requirements. The smart thing to do would be to customize the solution for your unique needs, worker skill levels, finances, and other factors. For these reasons, do not hurry and subscribe to well-publicized trendy systems. Though these may be widely used, they may not be the best fit for your unique needs. Do your homework, look into each short-listed system in detail, read a few SAP CPQ reviews, call the seller for explanations, and finally settle for the product that provides what you require. How Much Does SAP CPQ Cost? Contact the vendor for their enterprise pricing packages and other details. We realize that when you make a decision to buy CPQ Software it’s important not only to see how experts evaluate it in their reviews, but also to find out if the real people and companies that buy it are actually satisfied with the product. That’s why we’ve created our behavior-based Customer Satisfaction Algorithm™ that gathers customer reviews, comments and SAP CPQ reviews across a wide range of social media sites. The data is then presented in an easy to digest form showing how many people had positive and negative experience with SAP CPQ. With that information at hand you should be equipped to make an informed buying decision that you won’t regret. What are SAP CPQ pricing details? What integrations are available for SAP CPQ? If you need more information about SAP CPQ or you simply have a question let us know what you need and we’ll forward your request directly to the vendor.